Giovanni Battista Tiepolo (1696–1770), Rinaldo and Armida in Her Garden (1742-45), oil on canvas, 187 x 260 cm, The Art Institute of Chicago, Chicago, IL. Image by Sailko, via Wikimedia Commons. The crusaders led by Godfrey of Bouillon desperately need Rinaldo back if they are to resume their assault on Jerusalem. Guelph’s party, notably the knights Charles (Carlo) and Ubaldo, have gone off in his quest. But Rinaldo has been lured into a trap by the sorceress Armida, who intends to kill him. At the last moment, though, she changes her mind and abducts him in her chariot. 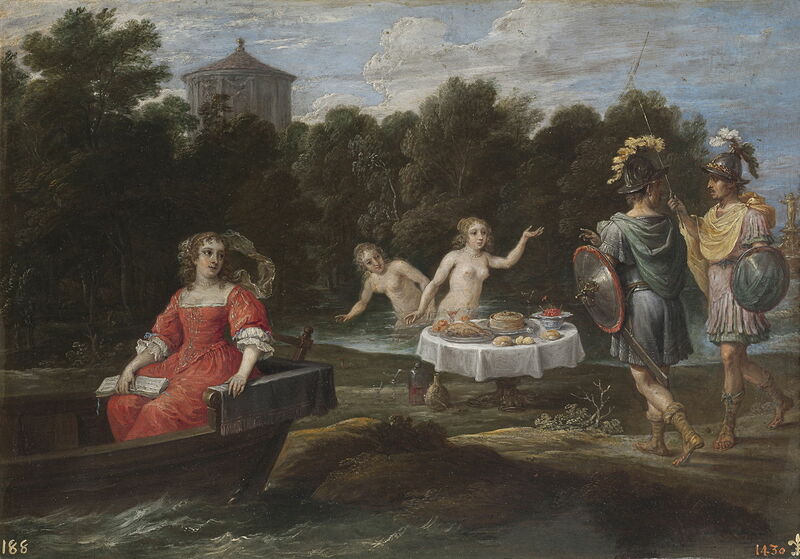 Armida’s chariot takes the couple to the distant, deserted and enchanted Fortunate Isles, where she lives in her garden which is perpetually in Spring. The wizard explains this to Charles and Ubaldo, to aid them in their mission to rescue the knight. David Teniers the Younger (1610–1690), The Magician Shows Carlos and Ubaldo the Whereabouts of Rinaldo (The search for Rinaldo) (1628-30), oil on copper, 27 x 39 cm , Museo Nacional del Prado, Madrid, Spain. Wikimedia Commons. 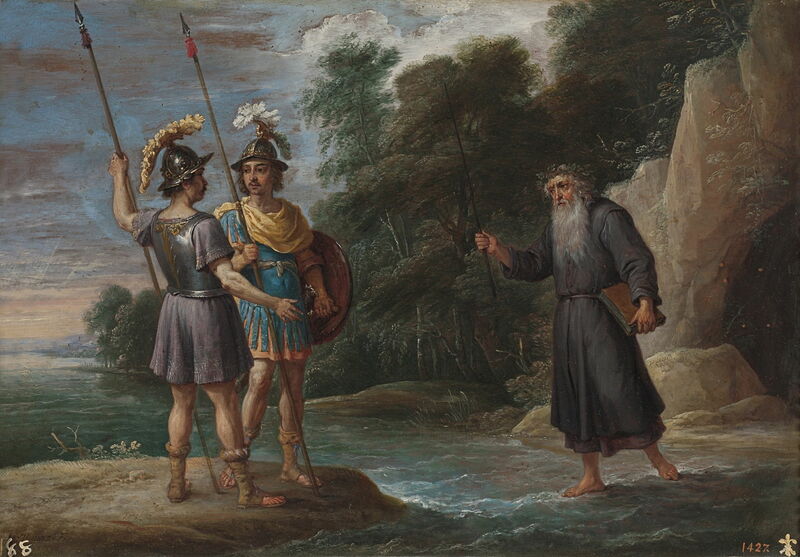 David Teniers the Younger’s The Magician Shows Carlos and Ubaldo the Whereabouts of Rinaldo (The search for Rinaldo) from 1628-30 is a small oil on copper painting in his series telling this section of Tasso’s epic. Here the wizard despatches the two knights to the Fortunate Isles. Charles and Ubaldo set off at the start of canto fifteen, retracing their steps with the wizard as their guide. The river then takes them gently down to the sea, where a ship awaits. They board, and sail at miraculous speed past Ascalon and the mouths of the River Nile, westward through the Mediterranean, and through the Pillars of Hercules into the Atlantic Ocean. They eventually approach the Fortunate Isles, pull into a harbour, and the two knights disembark. They spend the night at the foot of the mountain which they have to climb to reach Armida’s garden and its captive Rinaldo. They set off again at dawn, only to encounter their first obstacle: a fearsome dragon which blocks their passage up the mountain. Charles draws his sword ready to slay the dragon, but Ubaldo waves a golden wand – a gift of the wizard – which drives it away. 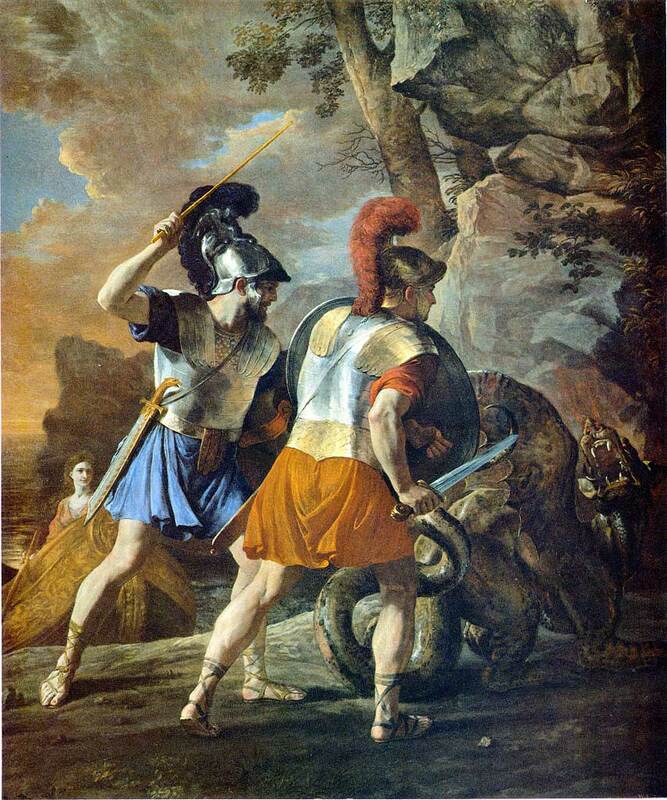 Poussin’s The Companions of Rinaldo (c 1633-4) shows the two knights confronting this dragon. Charles stands in the centre with his sword ready to tackle it, but Ubaldo behind him leaves his weapon in its scabbard and brandishes a golden wand instead. In the background at the left is the magic ship in which they sailed, and standing in its prow is the maiden who steered it. Johann Friedrich Overbeck (1789-1869), Ubaldo and Carlo free Rinaldo from Armida’s Castle (1819-27), fresco, dimensions not known, Casa Massimo, Rome, Italy. Image by Sailko, via Wikimedia Commons. 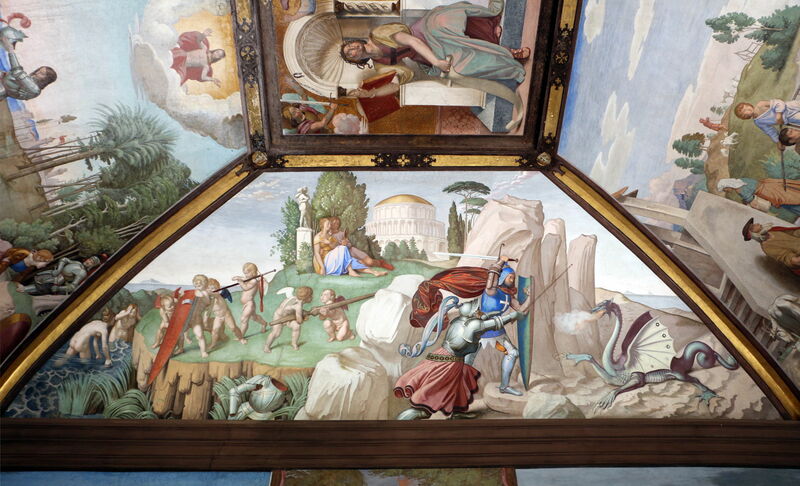 Johann Friedrich Overbeck’s fresco of Ubaldo and Carlo free Rinaldo from Armida’s Castle from 1819-27, in the Casa Massimo, Rome, shows an interesting composite scene. To the right of centre, Charles and Ubaldo wield their sword and wand, but in the distance are Armida and Rinaldo in the garden at the summit of the island. The amorini are playing with Rinaldo’s weapons, and his empty suit of armour has been cast in the undergrowth. Next, the two have to face a lion, which is similarly sent away with a wave of the wand. After that comes an army of animals, which disperse readily, and Charles and Ubaldo are on the ascent towards a stretch of snow and ice which they must cross before attaining Armida’s eternal Spring. Once up at the top, the two knights pause from their strenuous climb, slaking their thirst in a mountain stream. The grassy banks either side of the stream have a fine banquet laid out on them, and there are two naked young women frolicking in the water. David Teniers the Younger (1610–1690), Carlos and Ubaldo in The Fortunate Isles (1628-30), oil on copper, 27 x 39 cm, Museo Nacional del Prado, Madrid, Spain. Wikimedia Commons. David Teniers the Younger’s Carlos and Ubaldo in The Fortunate Isles (1628-30) shows this moment, the banquet having been placed on a clean white tablecloth rather than the grass. Surrounded by trees and standing proud on the skyline is their destination, Armida’s palace. I regret that I only have this monochrome image of Charles-Alexandre Coëssin de la Fosse’s painting of Danish Warriors in the Garden of Armida from 1848. The two knights are clearly dallying rather longer than their mission had intended. Once Charles and Ubaldo could tear themselves away from these nymphs, they pressed on to the circular outer wall of the palace, which opens the sixteenth canto. For it is here that they enter Armida’s garden. Édouard Muller (1823-1876), The Garden of Armida (1854), block-printed wallpaper, 386.1 x 335.3 cm, Philadelphia Museum of Art, Philadelphia, PA. Wikimedia Commons. In the eighteenth and nineteenth centuries, Armida’s garden appeared on all manner of products. 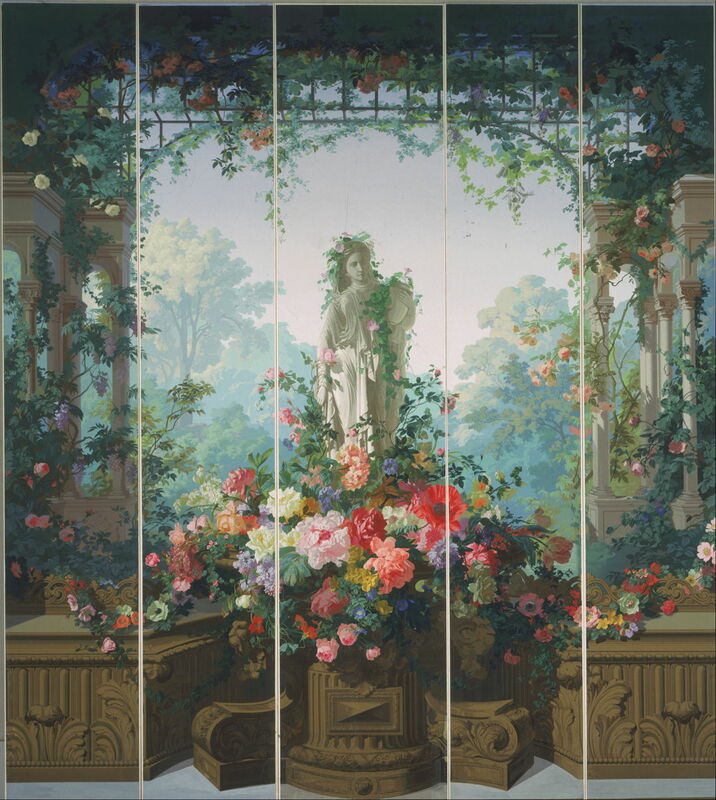 This wallpaper designed by Édouard Muller in 1854 is now in the Philadelphia Museum of Art. Other smaller images appeared on coffee cups and much else. Tasso gives a brief description of the garden, with its figs, apples and grape vines. Birds sing, and the wind murmurs softly. One bird speaks to the two knights, telling of the chaste and modest rose flower which springs virgin from its green leaves. 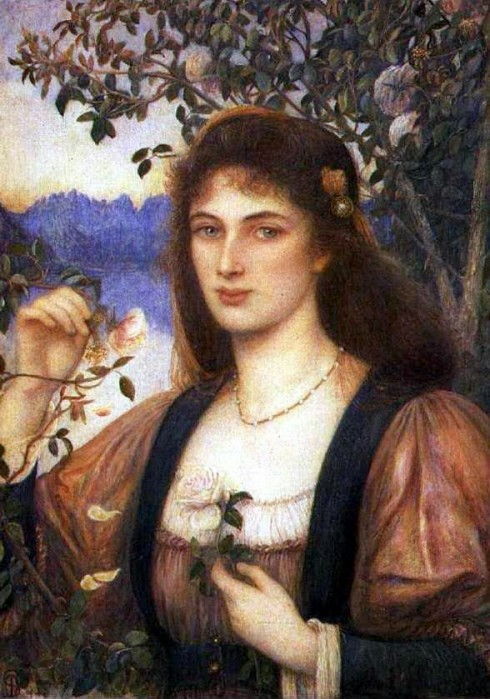 This passage about the rose was the inspiration for Marie Spartali Stillman’s exquisite watercolour of A Rose in Armida’s Garden from 1894. The artist gave this work to a family friend as a wedding gift. Charles and Ubaldo then peer through the leaves and spot a loving couple, who they presume to be Rinaldo and Armida. The knight’s head rests in Armida’s lap. He then stands up and takes a crystal glass which hangs at his side. Armida uses this as a mirror to adjust her hair, telling Rinaldo to keep looking into her eyes. 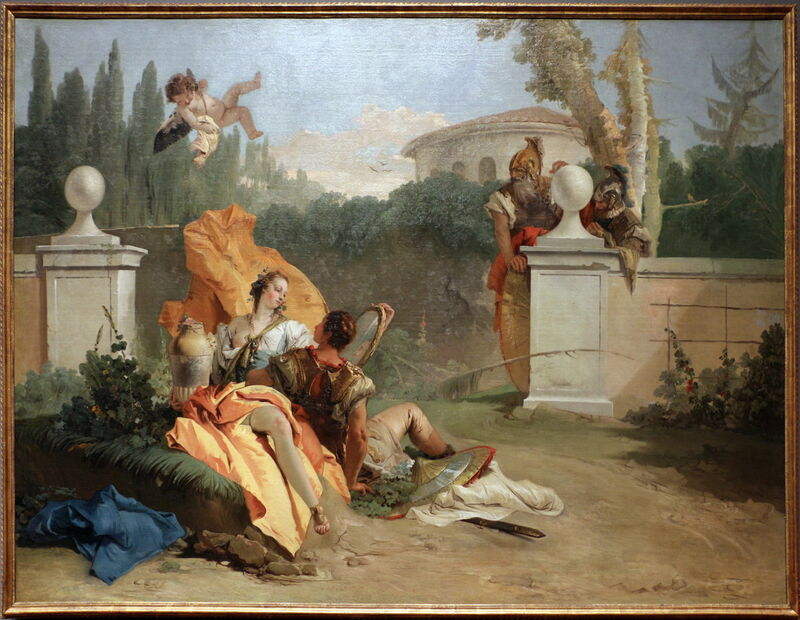 Tiepolo paints this clearly in his Rinaldo and Armida in Her Garden from 1742-45, now in The Art Institute of Chicago. It was originally hung in a special room dedicated to Tasso’s epic in the Palazzo Corner a San Polo in Venice, where it belonged to the noble Serbelloni family. 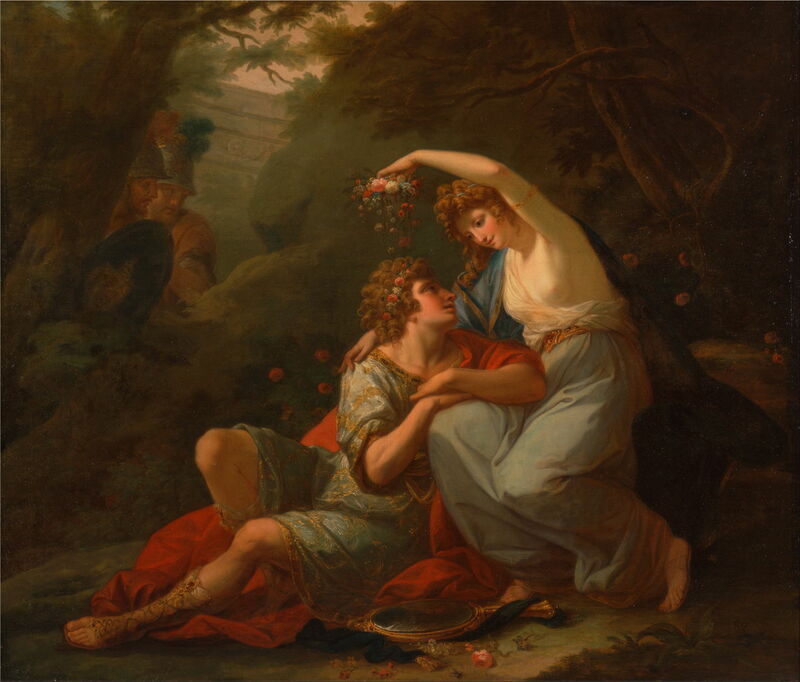 In Angelica Kauffman’s Rinaldo and Armida from 1771, the crystal glass is ready at Armida’s feet, and she is busy distracting him by sprinkling flowers over his head. Francesco Hayez (1791–1881), Rinaldo and Armida (1812-13), oil on canvas, dimensions not known, Gallerie dell’Accademia, Venice, Italy. Wikimedia Commons. Francesco Hayez shows a slight variation in his Rinaldo and Armida from 1812-13. Anticipating the next part of Tasso’s narrative, instead of Rinaldo wearing a crystal glass at his side, his circular shield rests on the ground next to Armida. Charles and Ubaldo are shown peering from behind a tree trunk, safely in the distance. Armida then kisses Rinaldo goodbye and leaves. Charles and Ubaldo see their opportunity and step out from the bushes, dressed in their full armour. Ubaldo holds a highly polished shield up so that Rinaldo can see himself for what he has become – a woman’s dandy, not a warrior knight. Posted in General, Life, Painting and tagged Crusade, de la Foss, Hayez, history, Jerusalem, Kauffman, Müller, mediaeval, narrative, Overbeck, painting, Poussin, Stillman, Tasso, Teniers, Tiepolo. Bookmark the permalink. Thank you. If you subscribe via a newsfeed, then this article explains how you can refine that to include just the Mac coverage here. If you come here via a browser bookmark, then click on the Macs item above to take you to the Mac front page, and bookmark that instead of the main front page.